Ah the man cave! That much-coveted sanctuary for all things man. Your personal fortress of solitude. Your home away – but within – your home. No matter your budget, no matter your needs, a man cave is a must to get away from the hustle and bustle of everyday life and your own space to escape (or avoid) your duties as a man, husband, and father. In fact, not only are man caves good for you, but are also great for your significant other. Personal space is crucial, and securing that personal space is the key to a happy relationship. So what makes a perfect man cave? What does it take to build one? Location, location, location! Ideally, your man cave should be physically disconnected from your home to ensure no rude interruptions. As in the UAE, this is normally not feasible, a basement (also not common in the country) or a garage would do. Just remember that garages tend to have poor ventilation and are not initially set up to be a regularly-used room. After getting the proper paperwork from the relevant authorities, hire air conditioning specialists to make sure your man cave stays nice, cool, and aerated, and electricians to rewire the room to make sure it can handle all the awesome man-technology that you’ll be needing. Now make that room cozy. Not cozy in the sense of making you feel all warm and fuzzy inside, but cozy as defined by your testosterone-driven ambitions. And that begins with the wall colors of your man cave. Remember, this is your personal refuge from reality, and don’t forget that this is your man cave’s true purpose. Think of shades of blue for your man cave walls. Blue is perfect as it combines sensibility with creating just the right male-dominated ambiance. To get it just right, hire a painter do this for you to ensure no spots and blemishes in your precious citadel. Nothing is worse than having to leave your man cave for a bite to eat or take care of some natural body functions. If your budget allows it (and trust us when we say this – for the ultimate man cave you need deeeeeep pockets), get a plumber to install a sink, and if you have room, a small bathroom. Depending on what room you chose your man cave to be in, it could require extensive work, but it’s well worth it in the end. For the basics, make sure you have a reasonably-sized fridge to be able to stock up on enough food and “refreshments” to weather a one-week long sandstorm. We aren’t talking about some dinky 44-inch plasma. You need to go for the state-of-the-art 4K LED with 3D options and is at LEAST 60 inches. Better yet, get a high-end projector screen and watch your shows on your wall. 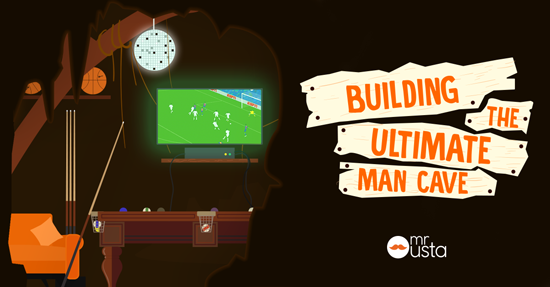 You don’t want to just ‘watch’ your La Liga games – you want to live them! Sure. Your football games look pretty on your TV, but don’t you really want to hear the roar of the crowds, the blurring whistle from the referee, the THUMP as the attacker’s knee snaps in two? A sounds system from a well-established brand is worth the investment then. Nothing says ‘I am man hear me roar!’ like your personal pool table. Remember, one of the reasons for your man cave is an excuse for you never to go outside. What you enjoy outside the man cave, you should also be enjoying it within. Man caves should be shared with your man-friends, and as such, you need ample seating. A big couch may work, but so do leather recliners with cup holders (seriously, go with the leather recliners). You may opt to buy your own furniture, but we highly recommend you get your furniture customized for that extra personal touch even though it will cost you a lot more (remember what we said about deeeeeep pockets?). Building the ultimate man cave is no small undertaking. It takes planning, patience, money, and more patience to get it just right. You can turn your man cave into a personal DIY project, or, since you’re willing to make a significant investment anyways, sit back and relax and let an interior designer handle all the hard work for you.